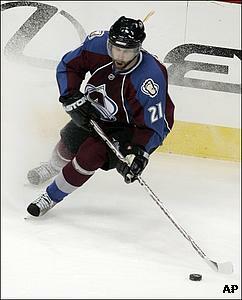 Peter Forsberg revitalized the Colorado Avalanche's postseason hopes when he decided to return to the NHL. The Avalanche now hope Forsberg's presence continues to improve their playoff position when they conclude their season series with the Edmonton Oilers on Friday night. Colorado (41-31-6) lost a season-high five straight from Feb. 12-20, dropping it into a ninth-place tie in the Western Conference. The Avalanche, though, have since gone 11-6-0, moving up to seventh with a five-point lead on 10th-place Edmonton (39-34-5). They have won seven of 12 with Forsberg in the lineup. Forsberg, sidelined with a right foot injury the first four months of the season, signed with Colorado on Feb. 25 and has six assists in six games since returning. His best performance came Wednesday, when he contributed three assists to lead the Avs to a 6-3 win over Vancouver. Forsberg joined Milan Hejduk (two goals, one assist) and Paul Stastny (one goal, two assists) on the second line late in the first period. "Any time you have a top-caliber player they've got to respect what he does," said Stastny, who has two goals and nine assists during a seven-game point streak. "He can score, too. He hasn't scored yet, but he's a pass-first player these days." Whether he's scoring goals or not, having Forsberg back has been enough to put the Avalanche in position for a playoff run. They have four games left to secure their 12th playoff berth in 13 seasons after missing out in 2006-07. Colorado, which opposes Northwest Division rivals for the remainder of the season, is 5-2-0 against the Oilers following a 7-5 loss at Edmonton on Saturday. Joe Sakic, Hejduk and Stastny - the Avs' leader with 45 assists and 68 points - each had multipoint efforts in the defeat. Forsberg hasn't faced Edmonton this season, but has 22 goals and 59 points - his most against any opponent - in 38 all-time meetings. 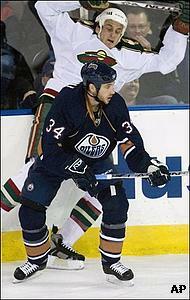 "Edmonton is one of the hottest teams since Christmas I would say," Hejduk told the Avalanche's official Web site. "It's going to be another tough game. We have to be ready for them and have a good start and hopefully we'll win it again." The Avalanche have won the first two contests on their three-game homestand, giving them seven victories in their last eight at the Pepsi Center, where they are 25-12-2. Only Detroit and Anaheim have more home wins (26). The Oilers have won four of their last six road games, but dropped the opener of their three-game swing, 3-1 at division-leading Minnesota on Wednesday. Fernando Pisani scored the lone goal, and Dwayne Roloson made 15 saves for Edmonton, which is three points behind Vancouver for the eighth and final postseason spot. "The teams are so close," said Oilers coach Craig MacTavish, whose team has won 12 of 16 to vault back into playoff contention. "Most of the teams are going to go right about .500 I would think. We can't, obviously. We need somebody else to go considerably less than that." Edmonton, hoping to make the playoffs for the second time in three seasons, looks to avoid losing back-to-back contests for the first time since a three-game skid from Feb. 16-22. All of those defeats were on the road, where the Oilers will play three of their remaining four games.